Depending on the time of year, the penguins may come home nightly. Little Penguins travel extensively at sea to feed during the day and clamber over the rocks at sunset to their homes. They go out again at dawn. When they have chicks, there is plenty of noise for upon their return to a hungry family, but it doesn’t last long. Many make their homes around our gardens – but they probably have more right to be there than we do – so please be patient with them. It’s also really important not to scare them, point torches at them or harass them – so by all means watch them waddle around, but it would be much appreciated if you don’t get in their way. 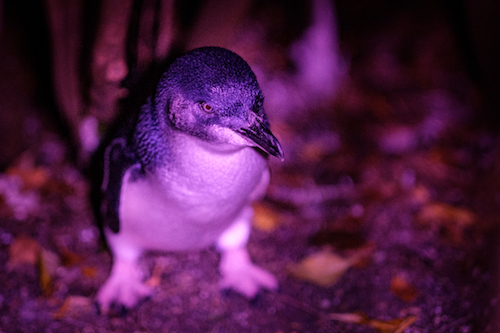 Place red cellophane on the lens of the torch and the torchlight will not disturb the Little Penguins so much. Between June and August male penguins return to either renovate old burrows or to dig new ones. Noisy male courting displays greet arriving female penguins. It’s a party. The usual number of two eggs may be found as early as May or as late as October. In successful years, two clutches might be reared in one season, it’s unusual, but possible. The penguin pairs share incubation shifts of usually 1–2 days and hatching takes place within 33 – 37 days. About 60% of the eggs successfully hatch. When 5 weeks old, the chicks stay outside burrows waiting to be fed by both parents. That’s really noisy! Within another 2 or 3 weeks they are ready to move to the sea.